Last week was a good mail week. Mainly because I was able to do a lot of catching up. 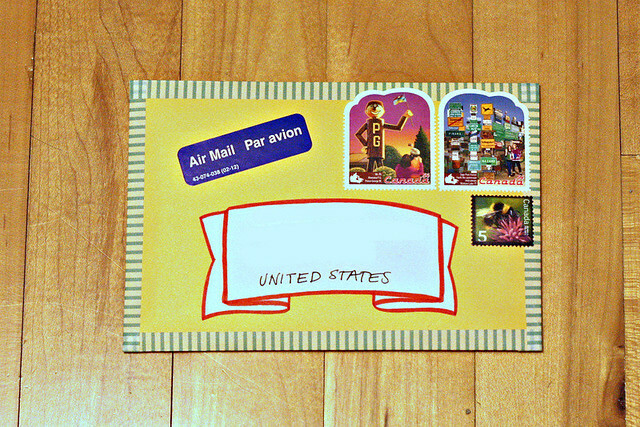 I sent out several pieces of mail, some orders but mainly personal correspondence. 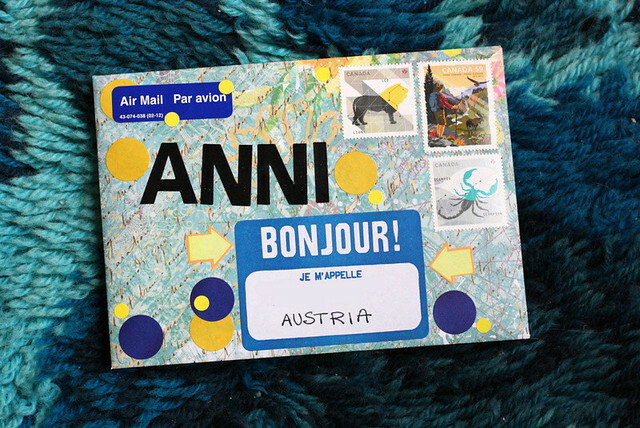 The first one is a long overdue letter to Anni in Austria. She has patiently waited for me to finally send her something. 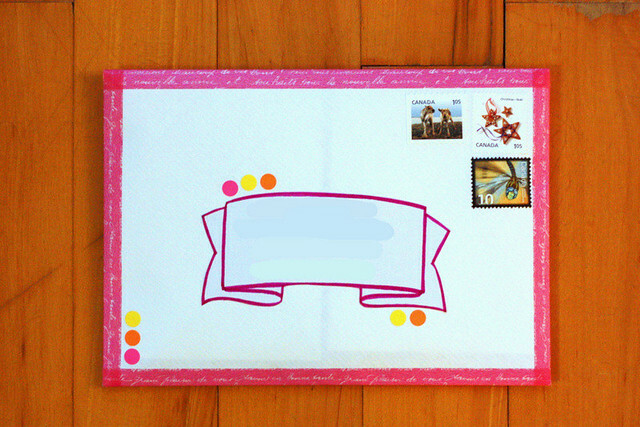 I wanted to put some extra effort in the envelope, so I made her a special one. I also used the last of those stamps for her. I was saving them for a special one just in case I wouldn't be able to get more of them, I felt these coordinated nicely with the colors from the envelope. 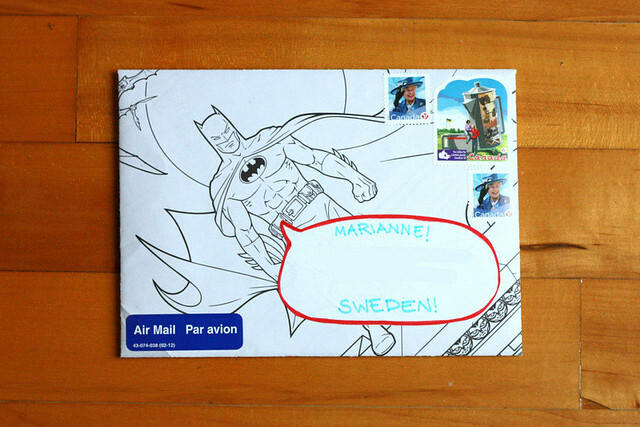 Another overdue letter, this time for Mary in Sweden. It's all themed, so I felt even the address label should be something different from the usual. I have a tutorial coming soon on how you can make something like this too! 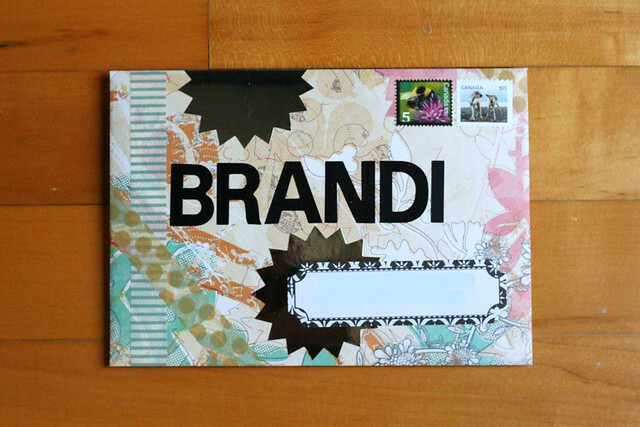 Then we have one for Brandi, you can probably tell from the massive lettering. I obviously got really into using these sticker letters... Too bad that all the people I was writing to have a ton of A's and N's in their names. Now I have a whole lot of leftover letters. Perhaps from now on I will start randomly calling you all 'Bob" or 'Steve' or 'Blkxfgrbd'. 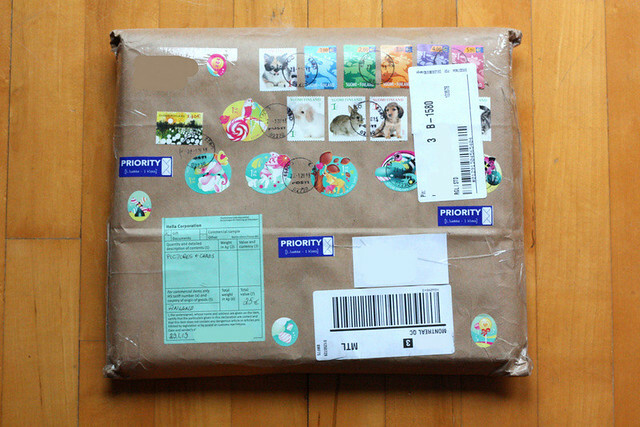 And after the washi tape envelope revelation last week, I had to send out a few of those too. The last outgoing lot was a few pieces of red mail. I'll show you the project soon, but I'd want to give it a little time to get to their recipients first. This was a small project on a theme I knew a few people would fully appreciate. More on that later. I have to say though that these don't look all that nice after covering the addresses, I felt it was the lettering that made the envelopes. You'll have to imagine them, they were really cool. The only one coming in this week was a package from my parents. 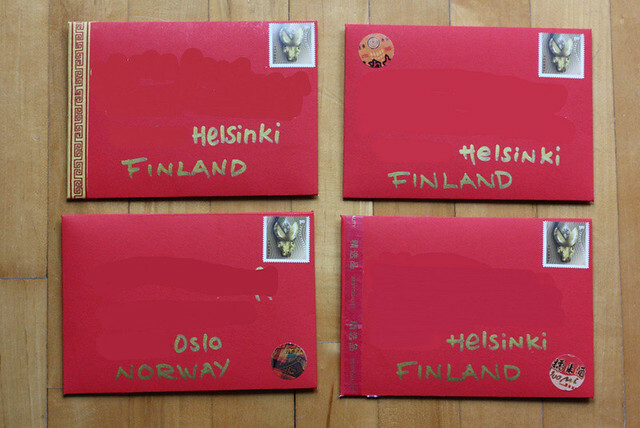 Finland does have some really awesome stamps, wouldn't you agree? Kiiiiitos kirjeestä! Piristi kummasti taas maanantaipäivää :D Olen muuten ihan samaa mieltä siitä, että Suomen postimerkit on nykyään aika ihania.. olisipa RUotsinkin yhtä jännittäviä. Loistavaa, sopivasti tuli maanantaiksi! Ma muuten innostuin kirjottamaan niin paljon, etten saanut kun pari tarraa messiin... Mulla ei ollut postimerkkeja tarpeeks kun vaan ton painoiseen kirjeeseen... hups, oli taas sanottavaa ilmeisesti. Taalla meilla on valilla ihan kivoja merkkeja, mut yleensa ne on tosi tylsia. Ei ole valikoimat kuitenkaan kovin hyvat.